How much does it cost to travel to Lille? How much money will you need in Lille? €64 ($72) is the average daily price for traveling in Lille. The average price of food for one day is €21 ($23). The average price of a hotel for a couple is €61 ($68). Additional pricing is in the table below. These average travel prices have been collected from other travelers to help you plan your own travel budget. How much money do I need for Lille? Lille is a city in northern France on the Deule River near France's border with Belgium. It has the fourth largest urban area in France behind Paris, Lyon, and Marseille. Lille (Rijsel in Flemish) may be France's most underrated major city. In recent decades this once-grimy industrial metropolis, with its economy based on declining industries, has transformed itself into a glittering and self-confident cultural and commercial hub. Highlights for the visitor include an attractive old town with a strong Flemish accent, three renowned art museums, stylish shopping, some excellent dining options and a cutting-edge, student-driven nightlife scene. The Lillois have a well-deserved reputation for friendliness  and they're so proud of being friendly that they often mention it. One top tourist sight in Lille is the monument Port de Paris, a triumphal arch built in the late 1600s to celebrate Louis XIV's conquest of Lille. Another great historical building and top sight is the Vieille Bourse, which is ornamented with caryatids and cornucopia. This Flemish Renaissance extravaganza was built in 1653. It consists of 24 separate houses set around a richly ornamented interior courtyard that hosts a used-book market and chess games. Yet another great sight is the Cathedrale de Notre Dame-de-la Treille. Lille's star-crossed neoclassical cathedral, begun in the 1850s, took well over a century to complete. Some say that the strikingly modern west facade looks better from the inside than it does from out front. For an authentic taste of grass-roots Lille, head to the ethnically mixed, family-friendly working-class quarter of Wazemmes, southwest of place du General de Gaulle, where old-school workers and immigrants from Africa live harmoniously alongside students and trendy bobos (bourgeois bohemians). 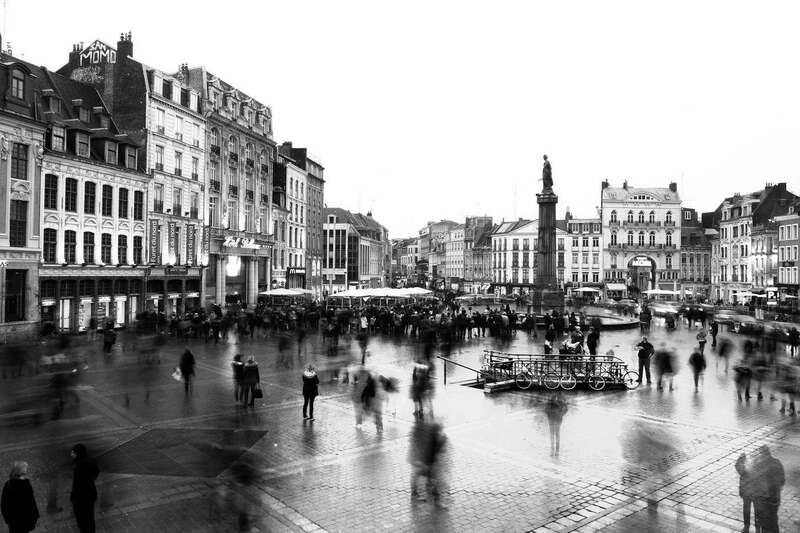 For many of the city's main attractions and sights, head to the Lille city center. The city center is the major hub in the area and is where you will find the historic, administrative, and economic centers of the city. The top attractions in this neighborhood are the historic Grand Place and the impressive Town Hall. This neighborhood also has several restaurants and shops to chose from. It's in Vieux Lille, the Old Town of the city, that the Flemish dash to Lille's character can be most clearly seen. The red brick buildings and narrow cobbled lanes have a distinct Belgian feel. The quarter houses the regular Euro-old town collection of bars, boutiques, and restaurants. This is where many of the city's premier sites are located: the town museum located in the 13th-century Musee de l'Hospice Comtesse, the Cathedrale Notre Dame de la Treille, and the birthplace of Charles de Gaulle. But sightseeing aside, this is a pleasant place to lose yourself on a sunny day, stopping only to test out another restaurant or ogle some designer fashion. For something unique to Lille, check out the Braderie de Lille. On the first weekend in September, Lille's entire city center  200km of footpaths  is transformed into the Braderie de Lille, billed as the world's largest flea market. It runs nonstop  yes, all night long  from 2pm on Saturday to 11pm on Sunday. There are several tours available in Lille. You could try a treasure hunt and beer tasting tour, or a food tasting tour, which takes you to some of the top restaurants in Old Town. There is a 2 hour bicycle tour that will take you past many of the main attractions. You could also try a unique convertible 2CV with a private guide and a champagne lunch. Lille also has a fantastic aquarium and three great museums to explore. Lille's population and culture is very diverse and varied, which makes it a great place for unique and tasty cuisine. Among the many culinary specialties, there are three dishes that especially embody all that is special about Lille cuisine. Carbonnade flamande (small chunks of beef stewed in beer), waterzoi (poultry or fish in a creamy sauce, served with baby vegetables) and potjevleesch (literally small potted meat, a white meat terrine in aspic). There's also rabbit with prunes for lovers of sweet-and-savory dishes, and the famous moules-frites (mussels and chips), a culinary symbol of the great September Braderie. Though there are many great restaurants to chose from, here are a few ideas to get you started: Estaminet T'Risel, which serves great northern French cuisine, La Dinette, which serves brunch and burgers, and L'Huitriere, which offers some great seafood options. Lille is easy to get to. Though it doesn't have any major airports itself, it is a very short train ride from London, Paris, and Brussels. Most places are walkable, although there's an efficient metro, tram and bus service with interchangeable tickets up to three stops, as well as a citywide bike rental service.